The climb to the highest peak of the Grandes Jorasses is a technically demanding route, over ice and rocks, It requires top shape, but the rewards are well worth the effort. A magnificent intinerary that was the background of some of the most memorable pages in the history of mountaineering. An itinerary that leads us to conquer the Pointe Walker (4,208 m) the highest peak of the Grandes Jorasses, a group of six granite peaks on the border line between Italy and France, in the northern part of the Mont Blanc massif. Meeting point: meeting in the square of the Skyway cable car for equipment check, as short briefing and transfer to Val Ferret. From Planpincieux (1,600 m), we make our way to the Boccalatte hut (2,803 m), following a trail equipped in sections with climbing aids. We leave the hut at 2.00 am. The route covers a short section of rocky terrain, then moraines, before we reach the glacier and the Rocher du Reposoir (3,450 m). At the end of the spur, we cross the Whymper Couloir, to the Rochers Whymper, which we follow for a short stretch to access the upper reaches of the Grandes Jorasses glacier. 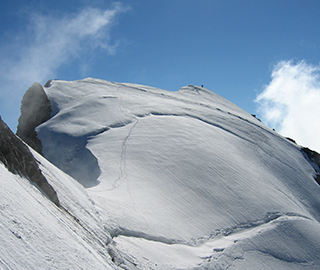 After crossing the ice, we will reach the craggy section beneath Pointe Walker, which offers direct access to the peak above, the highest in the Grandes Jorasses. We will descend either by the same route, or from the Rochers Whymper.